In my last post, I lamented the deer making a meal out of my Monarda. Generally, however, it is fortunate circumstance that many of the best hummingbird plants are relatively deer resistant. Many of the best hummingbird plants, including Monarda didyma, Stachys coccinea (pictured above) and plants in the genus Salvia and Agastache are in the mint family and have fragrant foliage which deer generally avoid. 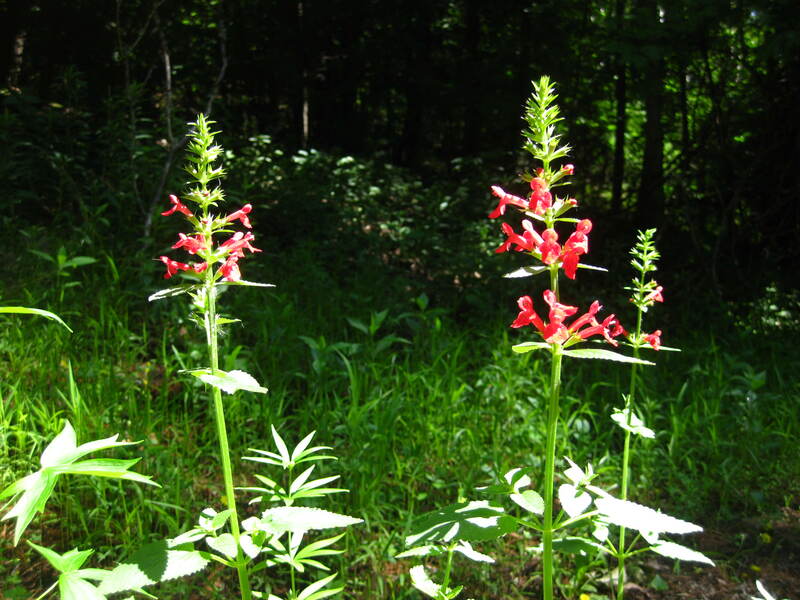 Plants in the genus Penstemon are also deer resistant, which is a good thing because the genus contains many great hummingbird plants. I’ve never had any problem with deer munching on penstemon in my garden, with one notable exception. My sand bed (subject of a future post) contains a variety of hardy species Penstemon, and is the first portion of my garden to provide substantial early color and nectar for hummingbirds, usually throughout the month of June. Once the snow melts the rosettes of leaves resume growth quickly and I eagerly await the appearance of the soon-to-follow flowering spikes. One night a couple of years ago in May when the flowering spikes were just beginning to shoot skyward, a deer visited my garden and nipped off every single flowering spike in my sand bed, greatly reducing that year’s penstemon show. Other than that single disastrous night, I’ve never had a deer so much as nibble on one leaf of any penstemon in my garden. Oddly enough, most of my deer problems involve hummingbird plants that are native to the Upper Midwest. The deer love my native columbine (Aquilegia canadensis) as well as royal catchfly (Silene regia) as well as S. virginica. These I have to spray with deer repellant in order to have any hope of seeing them bloom. One plant I’ve never had luck with is a native annual, orange jewelweed (Impatiens capensis). I once prepared a whole bed to devote to a large patch of jewelweed, and obtained seed to direct sow into the bed in the fall. The next spring I had an abundance of seedlings, but I soon discovered that deer love it, and I could never keep ahead of the marauding deer. By the time late summer rolled around, not a single plant remained to put out blooms. I still have a few seeds leftover in that bed germinate every year, but they always get eaten by deer long before they bloom. I still enjoy seeing jewelweed in bloom in the wild in the nearby Cannon River bottoms. If you find a patch of this plant blooming in the wild, it is almost guaranteed that you will see hummers battling over the blooms. Blooming seems perfectly timed with the peak of southbound hummingbird migration. 2 Responses to More on Deer in the Garden . . . I am a hummer rookie and was wondering if I could get some information about your sand beds? A recipe would be great. Also could you recommand a flowering tree for attrating hummers? I’m also in MN (twin cities) two I have found are the Red Buckeye and the Purple Rose Locust a.k.a. Idaho Locust. Most sites say they are zone 4 (borderline). I know I could mulch them really well, however, could your sand bed work for them? Tom: My sand beds are raised beds (about a foot above lawn level) filled with nothing but crushed limestone sand, washed to remove the fines. There is absolutely no organic matter added, no topsoil mixed in, and I haven’t fertilized the plants in it. I don’t water the plants in the bed, except when establishing new plants. I built the sand bed because I wanted to grow some of the great western hummingbird plants, particularly various Penstemon, that are cold-hardy enough to survive our winters but require sharp drainage. These plants also tend to flop if they are grown with too rich a soil and too much water. I’ve successfully grown a dozen or so Penstemon species, as well as select western Agastache, Salvia, Zauschneria, and Ipomopsis. I don’t think the sand bed would be the way to go for Red Buckeye–if you mean Aesculus pavia, it is an eastern shrub/small tree that grows at the edge of woodlands. I’ve had one in my garden for about five years now, but it is only about two feet tall, and hasn’t ever bloomed. It may get too much shade where it is located, but it has survived many winters here. If you are interested in woody plants, I would recommend two woody vines–Scarlet honeysuckle (Lonicera sempervirens) & trumpet vine (Campsis radicans). Both of course can be grown as tall vines on trellises, but I’ve also seen both grown as shrubs w/o a trellis, and I’ve seen pictures of trumpet vine grown up a wooden post with a single standard as a small tree. There are other woody shrubs and trees that can be grown here that hummingbirds will visit on occasion (e.g. lilac, crab apple) but they aren’t really hummer magnets–I imagine the locust you mention might be in that category.